Do you want to be able to formulate Soap Recipes wherever you are and not go running to your computer every time you need to make a change? • Email your recipes - email them to yourself to make a backup/saved copy just in case something happens to your phone! formulate based on what you have on hand or if you just want to try a new oil. 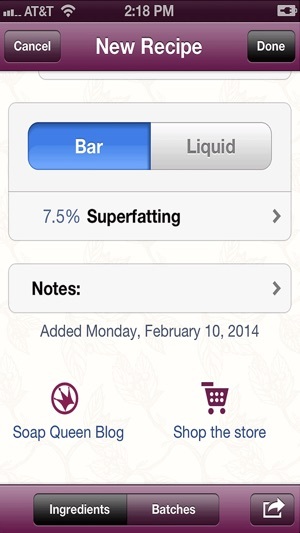 You can create liquid soap or bar soap recipes with this app. It will give results for NaOH (bar) or KOH (liquid) depending on what you are making. The calculator also figures out an estimated amount of liquids (which can be water, tea, milk, etc.) for your recipe. 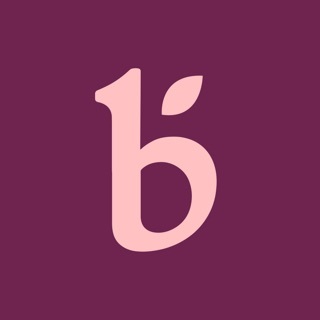 This app comes pre-loaded with some of our favorite, tried and true recipes formulated by Anne-Marie Faiola (aka the Soap Queen with over 20 years of CP soapmaking experience). You can edit those recipes or make your own from scratch. Recipes can be saved and emailed. Recipe resizer works for all recipes; just switch from ingredients to batches, start a new batch, then resize each batch to any size ounces or kilos. Once you have a recipe developed, you can easily make it larger or smaller to fit your specific mold by switching over to "Batches" mode and starting a new batch, then resizing your recipe. The calculator figures in grams as well as ounces. Just change the unit of measurement to 'metric' in the Settings if you prefer to work in grams. Change the settings by opening your iPhone/iPad settings, then scroll down until you see the Soap app. Click on it, then you'll see the settings screen that lets you set your units. Improvements for iOS8, iPhone6 and 6-plus. 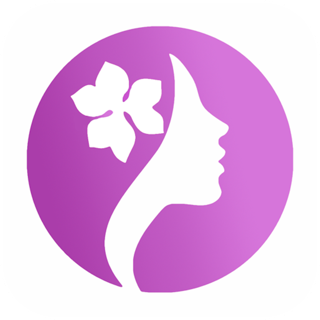 Addition of Announcements link to inform Soap users of future updates. Update: thanks soooo much for not bothering to update the app. I’ve lost all my batch notes. Thank goodness I kept notes of my recipe ingredients and the years I spent developing them aren’t lost. You have lost a customer forever. Was having no problems with this app until after latest update-now, batch notes are being deleted (I've lost 4 so far, and they kept being deleted even after entering the info 2-3 times) and new recipes not being saved (again, after being entered multiple times). This info is being lost despite hitting all of the "done" buttons after entering new information. I've found the app to be very helpful up to this point, but I am extremely frustrated that I've lost my notations. Fortunately, I have hard copy notes of my recent batches, but now I'm worried more info will be lost without my knowing until it is too late. I use your app all the time and I love it. 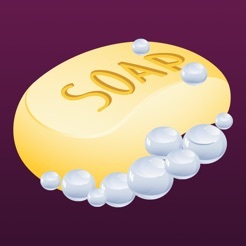 I had all my soap recipes saved in the app. I can’t open the app now because it is not compatible with IOS 11. Please update your software so we can still use the app.